Where is Jesus Christ now and what is He doing? We haven't heard much about what Christ has been doing. Where did He go? What's He been doing? Has He been idle or has He had a job to do? I want to tell you my friends, Jesus Christ has been busy. Jesus Christ is busy this minute. Jesus Christ this very minute is the head of His church. Where is that church, the church He heads, the church He is the active leader of and the active head of? He only works through human agencies in that church but no man is the head of that church. And it exists, it's here alive today on the earth today. Do you belong to that church or some other church? And how do you know? I'm not going to answer that question on this program but it's about time you look into some of these things my friends. These are vital things. Jesus Christ said, "I will build my church" (Matthew 16:18). The Bible shows you that that church is called — of course in twelve or thirteen places, the church of God because it is God's church, Gods' group; God's crowd; God's people. They are the people that are begotten of God. They are the begotten children of God. They are God's own children by an actual begettal of God's Spirit that comes out from Him, and so they belong to Him. And the church of God means the church God owns, it's God's church. It belongs to Him and it is made up of those people that belong to God. And it is also called the body of Christ. It is the body that does the work of Christ. But Christ is still the head of that body and He is still the leader, the dynamic living leader who is leading it today, actively. Yes I think we need to investigate some of those things because the gates of hell have never prevailed against that church. It's still alive and going and still doing the work of Christ on this earth. You need to find it. And now let's finish this portion of the subject that we've been on the past several broadcasts in this daily series. We had come in the book that tells what Jesus Christ has been doing these last 1900 years, where He is now, what He's doing now: the book of Hebrews, the priesthood book. We've come up to this eighth chapter where we find that He has obtained a more excellent ministry than the ministers under the Levitical priesthood between the time of Moses and Christ. That He is "...the mediator of a better covenant..." (Hebrews 8:6). Now just theologically that might appear pretty dry and dull to a lot of people, but we've been seeing my friends, that we're living in the times when that very thing is mighty important because we're living in days now when scientists tell us that human life can be blasted out of existence. That the weapons are now available that can lay waste the entire North American continent without warning in one night. Not only the United States, that includes Canada and Mexico, and that's a fact. And we're living in terrifying times and world scientists tell us that unless we have world government that's going to happen. And yet world government devised by man is utterly impossible and it will never be. And yet if we don't have world government human life is going to be blasted out of existence. Now that's exactly what we face and it's a pretty serious situation and your life is at stake. The life of your children is at stake and it's about time we begin to face it and wake up. Now as I've been mentioning, let me just real quickly skim over what we've been covering and see if we can get on and conclude this portion of it about this covenant. Jesus Christ also foretold the same time. He said that the time of trouble would come and it will come during World War III. He prophesied a time of world wars, then He said there would be famines and disease epidemics in different places and earthquakes. Now we've only had a foretaste of that. The world war is getting progressively worse. We' re only in a recess now between World War II and World War III. Everybody knows World War III is coming. Bible prophecy says World War III is coming, and when it comes, according to the biblical prophecies, it'll come with a terrific famine. We're having weather disturbances in the United States. There's a revolution in weather and there's going to be an epidemic of disease that the physicians and doctors and medical science will know nothing about, will be utterly unable to cope with in any way whatsoever and there's a terrible time coming. Now Christ Himself said, except God, by supernatural power, will intervene and step in and shorten these hellish days that are coming when World War III does come upon us, that "...no flesh should be saved alive" (Mark 13:20 paraphrased). In other words human life would be blasted out of existence. In other words He said, 1900 years before our modern scientists were born, practically, the same thing that they are saying today. World famous scientists see it. Einstein knew it. Other living scientists today know it. They're frankly frightened. Now my friends, there is only one kind of security. The most important thing on earth to you and me right now is to find security, and the security is in God Almighty. And either one of two things are going to happen. Either there is an Almighty God who will set up world government here for us on this earth which man is incapable of doing himself, or else you and I and our children and our grandchildren and all of the people on the face of this earth are going to be blasted out of existence, and that in the very next few years. Now we're face to face with one of those two alternatives. You people, a few of you, who don't even believe in God and don't believe there's any God, you'd better face the facts because you're facing real things. These facts are very real in the world today. Now Christ in His ministry proclaimed one thing, the kingdom of God. And the kingdom of God is that world ruling government that all the prophecies of the Bible say God Almighty is going to set up on this earth in our generation now. Now they don't just come out and say twentieth century, but we can figure our generation unmistakably and without any question whatsoever that the time is now. That when the very things happening now on the earth happen, as Christ said, "...know that it is near, even at the doors" (Matthew 24:33). We are in the very generation when these things are going to happen. Now God is going to set up a government on this earth to rule the world and save us from ourselves. Christ is coming back to this earth as the King of kings and the Lord of lords. And when He sets up that government there will have to be a foundation for it. When the United States government was set up, I have mentioned this now the last several programs, so let me just recapitulate it for just a moment. The founding fathers as we have called them, George Washington and Thomas Jefferson and John Adams and Benjamin Franklin and those men, and John Hancock, whose name appeared so prominently, the first one to sign the Declaration of Independence that was wasn't it? I've seen his own handwriting, the original document, as I think I mentioned in a preceding program, when it was on public display down in the Library of Congress in Washington DC. Well, those men had the wisdom to give us a foundation for our government today. And that foundation we call the Constitution of the United States and thousands of young men have given their lives in war and in battle to preserve that Constitution and everything it guarantees us. Now you can't have a government and a kingdom without some kind of a legal document that forms the basis, the foundation of that nation or of that kingdom, that government. When a number of nations wanted to get together, and I've used this as an illustration and pointed it out in these past few programs, to form what they call the League of Nations. And they intended to give it some real powers of government but of course the Congress of the United States stepped in and broke that up. They had to have something as a foundation. So what they had was what was called the Covenant of the League of Nations. That is the thing that the Congress of the United States refused to enter into. What is a covenant? It is an agreement, it is a legal contract between two or more parties, that's what it is. Now here we find in the Bible that Jesus Christ is going to be the minister of a covenant that will be better than the one of which Moses was the minister, or the mediator, made with ancient Israel. Now when God set up a nation on this earth way back there in the time of Moses, a nation to be one of the nations, one of the kingdoms of this world, it had to have a foundation. But since it was God's nation, it necessitated an agreement between God and the people that He was making a nation out of, the people of Israel. Now God says to you as an individual, if you will voluntarily surrender yourself to God and His government to let Him rule over your life, your personal private life, and govern you so that you are completely yielded and surrendered, so that you live by every word of God and study the Bible, which is God's word and contains God's law, to learn what God commands and the way that God has said you should live, then He promises you great benefits. He promises you that when you're sick He will heal you. He promises you that if you get in financial trouble He'll deliver you out of it and supply your every need. He promises you that when your enemies come against you, He'll fight your enemies and take care of it and protect you. He promises you to put an angel with you to protect you from physical harm and everything. He promises you to prosper you and to give you health. He promises you that you will be happy and that you'll have everything that your heart desires that is right and that is good for you. That's what God promises you but you have to surrender to Him voluntarily. You have to come into His government as an individual, personal, private thing and let Him rule you. Jesus Christ is Lord as well as Savior. He said, "...why call ye me Lord, Lord, and do not the things [that] I say" (Luke 6:46)? A Lord is a master and a ruler. A Lord is the one who rules you and you are obedient to. Now a lot of people call Christ, Lord, that don't obey Him at all. You show where in His word where Christ says, and Christ is the author, He's the living word of God. The Bible is only the written word and Christ is its author. God commanded Christ, God the Father, Christ spoke only what the Father commanded Him. And you can quote the Bible and say, "Here's what is commanded and this is really through the authority of Christ. He and the Father are one anyway, there's no difference and the Holy Spirit who inspired every word of God." And they'll say, "Yes, I see that the Bible commands that and says it's wrong to do thus and so, but I don't see where it makes any difference. I don't see where it makes any difference." Well He said to this nation; "...if you will obey my voice indeed, you will be the head nation of the earth" (Exodus 19:5 paraphrased). He said that in different language in a number of different places but God made us free moral agents, He allowed Israel to do what they please. Well the Israelites, "...all the people answered together, and said, All that the [Eternal] said, we will do" (Exodus 19:8 paraphrased). They agreed, there was an agreement, but the agreement had to be ratified by blood. The Ten Commandments God wrote with His own finger on two tables of stone, the work of His own hands. He wrote them on the two tables of stone with His own finger with the work of His own hands. And a lot of people seem to think, "Well the tables of the Covenant? Well that means then the tables are the Covenant." Well I see a door right here in this radio studio. The door isn't the studio though, and it's one of the doors in this building but the door is not the building. It's not the building, it's just a part of the building. It enters into it yes, but you can take the door off and throw it away for that matter and the building is still going to be here and the studio is still going to be here. So it is not the studio, it is not the building. Now the tables, or the Ten Commandments, they were a part, they were the conditions the people had to perform. They were a part but they were not the agreement, because the Covenant was an agreement by and between the two parties. Now the Old Covenant was not entered into in the twentieth chapter of Exodus. The Old Covenant was made and sealed and ratified by blood and you find the account not in the twentieth but the twenty-fourth chapter of Exodus, and here it is real quickly, listen. It was an agreement by and between two parties, between God and Israel. God promised to give them certain rewards and payment on condition that they did certain things that He required. It's just like, supposing I'm going to build a new house and I have a bid. A contractor agrees to do it for a certain amount of money. I give him the plans and specifications. I say, "Provided that you build it according to the plans and specifications that my architect has put on these blueprints, on these pieces of paper, I will pay you such and such a sum when you complete the work." Now it's an agreement by which he agrees to perform certain duties and which I agree on his performance if he performs it, to pay him a certain sum. Now God had agreed that if these people would obey what He said and keep His commandments, then on completion of that, or as they did it, God would give them certain rewards. He'd make them the greatest nation on earth. He said they'd have peace in the land. If they were invaded by another nation that ten of them could chase a hundred and a hundred of them could put ten thousand to flight. He said their crops would be so abundant they would have a year-round harvest. They would become the wealthiest people on earth. They would become the mightiest most powerful nation on earth. He said He would rid them of sickness and disease because, He said, "I am Yahwah Ropha." In other words that is the Hebrew name for 'God our healer', the God that heals you. God gave them promises of health. He gave them promises of prosperity. He gave them promises of peace. He gave them promises of dominance over the world, the head nation and not the tail, IF they would keep His commandments. IF they would do what He says. Now you as an individual, He gives you promises of prosperity in the long run. That doesn't mean you're going to be a multimillionaire next week but He does promise to prosper you and to bless you and in due time you will have plenty. And then again God's word says that if and when He prospers you, don't set your heart on the material prosperity either. Well, but God said "choose," He made us free moral agents. We can have His blessings, His benefits, or we can choose and God will allow us to disobey and bring curses on ourselves and final death. It's up to us, we make up our own minds. Well there was the Old Covenant made. 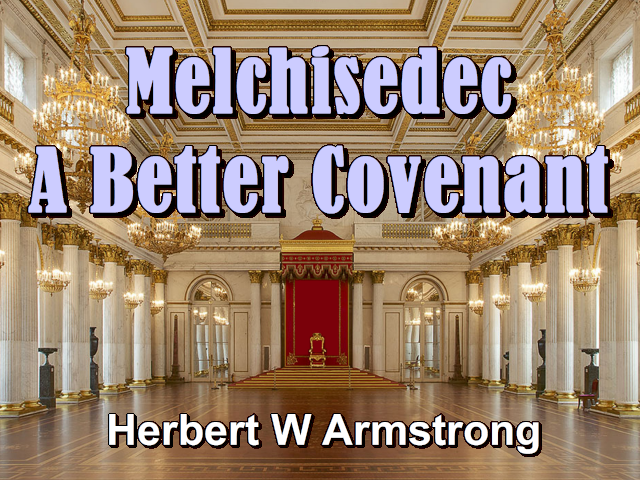 Now we read over here in the eighth chapter of Hebrews that the day is coming when a better covenant than that is to be made, established on better promises. What were those promises? They'd be the head nation on earth, they'd have prosperity, they'd have peace, they would have wealth, they would have all of those things. But it was all physical, physical health, physical wealth, physical peace from other nations. Eternal inheritance, in other words we are to be given eternal life. We're to be made the born children of God, raised from the human plane though we will not be human any longer. Raised clear above the plane of the angels, clear up to the very plane of God Himself. To the rank of God until we be like God. We'll be holy as God is holy. We're going to be glorified as Jesus Christ is now glorified with the whole power of God. Jesus is the seed to whom the promises were made and the promise was this earth for an everlasting possession. We'll inherit the whole earth until WE own the earth. God owns the earth, you don't my friends, now. We just live here as foreigners and strangers and that's all Israel had any promise of then, but God promised to let them live on His land if they would obey Him. Now we're being promised the actual ownership of the earth because Christ is the heir of it, and we are co-heirs and joint heirs with Him if we keep His commandments, if we do those things that are pleasing in His sight. Well now, we were seeing here the other day that the Greek word of course there was 'diatheke' and that means, actually not Covenant but a Will, a Last Will and Testament and that's something else all different. But nevertheless it is a Covenant too for this reason. Now that could be made Testament but they properly translated it 'Covenant' because of this reason; there is a condition. A Covenant is an agreement between two or more parties. A Testament is something that you bequeath, an instrument by which you bequeath to others your property or possessions after your death. Now this is the Last Will and Testament of Jesus Christ. He did die. He is the heir of the earth. He is the heir of life and eternal life, and He has bequeathed that to us, eternal life and the possession of this earth. "...IF you be Christ's [IF, IF, there's that great big two letter word 'if.' IF you be Christ's] then are you Abraham's children [that is, Israelites], and heirs according to the promise." (Galatians 3:29). You're not Gentiles. I spent a lot of time here a few broadcasts back in showing you that a Gentile is without Christ, without hope, without God and having no hope, and a stranger and an alien to the covenants of promise which are made to Israel. Now a lot of people say, "Well the Old Covenant is made to Israel, the New is going to made with us Gentiles." You'd better read your Bible again, see who the new is going to be made with. It's a Testament, it's the Last Will and Testament of Jesus Christ but there are conditions. "IF you be Christ's" (Galatians 3:29). You can't be Christ's my friends unless you have repented, unless you have come with faith in Christ and been reconciled to God and received the Holy Spirit. In Romans the eighth chapter and the ninth verse you'll read that if you have not received the Spirit of Christ, you are none of His. It is those that are led by the Spirit of Christ, by the Holy Spirit, that are the sons of God. And Christ gives His Holy Spirit (Acts 5:32) only to those that obey Him. Now if you haven't surrendered to obey God I don't care how much you profess belief. I don't care how many times you have professed Christ before men. I don't care how much that kind of teaching you have listened to, you are none of His, you are not a Christian unless you have yielded to surrender to obey God. Because God does not give His Holy Spirit to any others, and if you haven't the Holy Spirit of God you are none of His. Now the Old Covenant was in that sense also a Testament because there were the conditions. There were the conditions also under the Old. Oh the promises of eternal inheritance, of eternal life and salvation, where you'll be now divine, no longer human and of the ownership of the earth, not just allowed to live here. If there hadn't been something wrong with the first there'd been no place for the second. What was wrong with the first? Did God make the mistake? Some people say, "Well the first covenant was the Ten Commandments, they were all wrong. God made a mistake. Christ had to come and do away with His Father's mistake and therefore Christ has given a New Testament." Another thing that they seem to think was wrong, was made with the Jews, the new will be made with the Gentiles. And so Christ is going to give us everything good but we have nothing to do but just receive it. You hear people talk about receiving Christ. What about giving yourself to Him my friends? "For finding fault with them [the people that didn't keep their word that they had promised three times to obey Him. Finding fault with them, verse eight] he saith, Behold the days come, saith the [Eternal] [that] I will make a new covenant with the house of Israel and the house of Judah: Not according to the covenant that I made with their fathers in the day when I took them by the hand to lead them out of the land of Egypt [why? ], because they [the fathers] continued not in my covenant, and I regarded them not, saith the Lord." (Hebrews 8:8-9). "The works of his hands are [forever and ever. The commandments of God, the law of God] ...stand fast for ever and ever, and [is] done in truth and uprightness." (Psalm 111:7-8 paraphrased). You'd better let Him put His law in your mind and in your heart or you'll never make the new covenant with Jesus Christ, to be there, set up the new nation and be one of the citizens of that wonderful kingdom. Now listen, I want you to sit down right now and write in for two very special booklets. Now listen carefully, you must ask for these booklets by name. First, 'Why Were You Born?' I think of all of the booklets that we have written, that we've published, that I've been announcing on this program for years and years, that there has never been one more important than this. This lays down before you the whole purpose of life. It lays down the whole of the why's and wherefore's of this thing that we call salvation. Why do we need it and just what is it? What do you get and how? The name of this booklet, 'Why Were You Born?' Now jot that down immediately. I hope you have pen or pencil and paper right there before you, if not get it immediately and jot it down right now. Now the other booklet, 'All About Water Baptism.' Just write in for the booklet on water baptism. Now this booklet, a very attractive booklet completely answers the question is water baptism essential to salvation? It explains the way of salvation. Do you know that becoming converted means being changed my friends, it means a totally changed life. When one receives the Holy Spirit of God his whole viewpoint, his whole outlook, his purposes, his goals, his ways of thought, his way of life, everything becomes changed. I wonder if you understand all of that. Well these booklets my friends, will make it very plain. Now first here's this booklet 'Why Were You Born?' Be sure and write in for that and list the booklet by name, 'Why Were You Born?.' And the other booklet on 'Water Baptism.' 'Water Baptism.' And so now this is Herbert W Armstrong saying, "Goodbye friends until tomorrow."